The after-care section is where you will spend most of your time, and it's a shame that this section is unlikely to hold the attention of even the most animal loving game player. At the start of the game there are only kittens to contend with, but as you progress your grandfather will build you pens for dogs, rabbits, horses and even pigs. Animals must be fed and watered. This can be done by somewhat awkwardly dragging the food or water containers over to the appropriate place in the pen. Then, in order to heal the animals quickly, you can play with them or simply pet them. Toys can be purchased for each type of animal. Cats will chase toy mice and balls and dogs will, somewhat reluctantly, chase sticks. Rabbits will dash through tunnels and horses can be encouraged to exercise and jump over fences. Playing with the animals seems to do little to encourage them to get better. The best way to make your animals healthy again is to "pet" them. This involves simply rubbing the stylus over the animal as fast as you can. 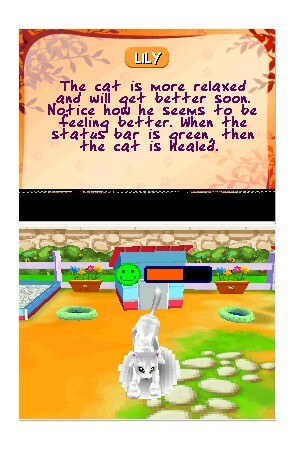 The standard of graphics throughout the game is low, especially compared to the better pet simulators on the DS, such as Nintendogs. The poor graphics annoy most when you are petting and playing with your sick animals. Each creature is a carbon copy and completely devoid of personality. Constantly petting them and filling their food and water is a chore not a pleasure and all the children we asked were quickly bored with this part of the game. Once you're done petting, feeding and watering, you can go and talk to your cousin Eric, who is always happy to clean out the animal pens. He also twitches and moves in a most disturbing manner when you talk to him, as do several of the other badly animated characters in the game. When an animal is fully healed, he or she can be returned to the owner. You then earn money which can be spent on building or upgrading pens or buying fancy accessories for your hospital. It's a shame that the after-care never goes beyond simple petting and feeding duties. The game would have been much better if there were operations or other duties to carry out, particularly if they had been done to the same high standard as the diagnosis mini-games. Finally, there's a wardrobe in your house where you can change your outfits and, when you get as far as building a horse pen, you can trade horses between this game and Petz: Horsez 2. A nice addition, though we didn't have a copy of this game handy to try this feature. Imagine Animal Doctor / Imagine Pet Vet is unfortunately another children's title that simply lacks polish. While the initial diagnostic games are fun and well presented, the after-care section is tedious and frustrating. Add to that a fiddly interface and poor visuals and the chance to be Sally the vet quickly becomes unappealing. The most animal crazy youngsters might get some enjoyment from the game, the rest of us should steer well clear. No amount of doctoring is going to save this runt from the bargain bins. Copyright © 2008-2009 Lets-Play-DS.com. This site is not affiliated with or endorsed by Nintendo Corporation. The information on this website is provided "as is" without warranty of any kind.